Previously, on MinerBumping... Javar Miromme's attempts at Anti-Ganking produced nothing but failure. When Javar idled by a Uedama stargate in his prized Ashimmu, he was ganked himself. One of the gankers, Agent Trump The King, became the target of Javar's fury. 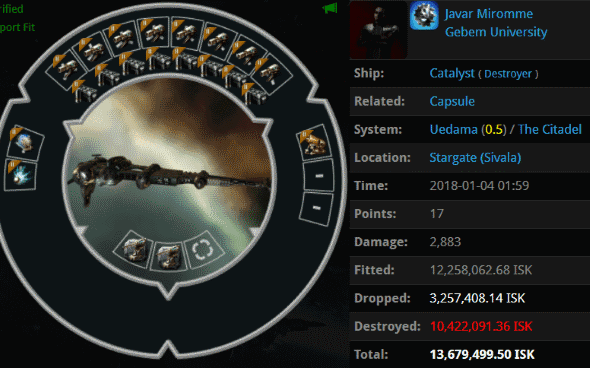 Javar returned to Uedama in a gank Catalyst. Apparently he intended to counter-gank our heroes. Instead, he was killed again, this time by Agent Harletta Quinn. You might say Javar was counter-counter-ganked. It was interesting that Javar had shown up in a gank Catalyst. It was as if he thought to himself, "Those gents from the mighty CODE. alliance make it look so easy. I must learn from them." ...On the other hand, Javar hadn't learned very much so far. 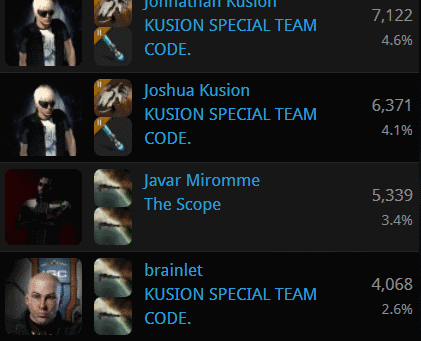 He cursed the Code enforcers for having so many friends. Agent Trump reminded Javar about the round of elite PvP they'd enjoyed earlier that day. It didn't cheer him up. Javar openly confessed his treason in Uedama local chat. He really thought he could defeat the New Order with a Catalyst. Unable to win at EVE, the rebel concluded that EVE must be broken. EVE certainly has its flaws, but allowing people like Trump The King to display their elite PvP prowess is not one of them. It is the Anti-Gankers who are broken. The rebel claimed that he was offended by the unethical acts of griefing committed by our Agents. And yet, earlier, Javar had made comments hinting at the envy he felt toward these same Code enforcers. "I could be as successful as those New Order people," says the rebel, "...if only I were not so righteous." Eventually, Javar also began solo ganking highsec miners. As a result, his security status plummeted. What was going on here? Actually, what happened here is easy to understand. Javar Miromme experienced a moment of genuine honesty and introspection. He didn't hate the gankers like he'd thought he did--like the rebels had always encouraged him to. No, watching the gankers win victories every day made him realize that he wasn't happy as a carebear and a Code violator (people never are). By contrast, the Agents of the New Order always seemed to enjoy themselves. 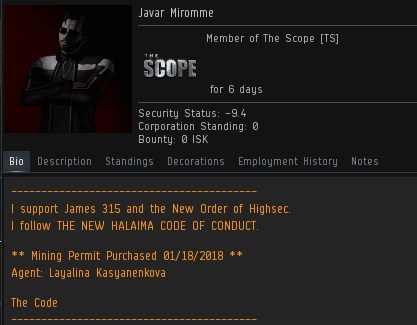 With these things in mind, there was only one rational course of action for Javar: He bought a permit, picked up a Catalyst, and enforced the Code. A timely lesson for all the remaining rebels out there. There IS hope for ag yet! Thomas, Grand Design, Bloody Bear, Vue Poppette, Conchise, and all the other fanbois, stop failing and rebelling! Helping us build a better High Sec! You'll be glad you did! Start with the Code, then get a permit, and then, then the fun begins! Now that was a twist I didn't see coming. Everyone loves a classic story of redemption. I hope Javar is indeed on the right path now. The power of the Code to make New Eden a better place never stops suprising me. That was quite the twist, a happy ending though! Wow just wow antigankers are failing so hard. How are they so dumb? --"He really thought he could defeat the New Order with a Catalyst"
Calm down miner. You can get a permit too. Sorry, but it doesn't matter that javar murdered a few miners. Unless he was a plant from the beginning, his attitude and volatile nature combined with all that vulgarity make me think that's how he acts IRL. Not because he is "grrr ganker", but because he showed absolutely zero self control. I'm sure he would have responded to an angry miner much like he responded to Agent Trump, with vulgarity and ignorance. Hollow victory at best, but at least the Code wins! If his language is any indicator just about as smart as the last spymaster. I agree with the 8:41 poster. Players that lose control so easily are generally a liability. It is better to keep them in a perpetual state of rage, rather than allow them to alternate between different emotional states. It's better to convince them to go play something else, however that may be accomplished. If I wouldn't let someone like javar hang around my friends and family IRL, why would I associate with him in game? Violent behavior has only one proper response, overwhelming violence and intimidation in return, until you completely break the subject. Only then can he be truly shaped in our image. Gank him until he quits. Hunt him until he's afraid to log in, until he twitches before forcibly making himself open another mail from you; only then, only when he is truly dreads logging in, can you successfully reprogram him. Don't be weak when it comes to discipline and someone like javar, stand strong! Even when his wails of submission are nothing more than muffled sobs, he still has not had enough. EvE is worth fighting for! Always! Hes not right in the head, no. But CODE. is a very kind and inclusive bunch. If we can help him transition into a better member of society, who are you to judge? Anon240's ignorance is in assuming the New Order should be all inclusive. I guess hugs and a permit would have stopped kalynn. You can't help him transition into anything, dumbass, you are just a space nerd like the rest of us, you have no qualifications. Lol u r tard. 240 you may be too simple for the NO, and I'm sure you can't understand why. Press F1 to turn on fun mode. And not the only antiganker to switch sides recently. I had the privilege of selling a permit to Noctis Locus just the other day. High Sec is changing! Anti-gankers are coming to their senses finally. Where is my single ECM drone? Did i leave it 100km from the gank again?